Six Flags Over Texas Fright Fest - We keep hearing that 2015 is “the scariest one yet” by longtime park employees, and we’ve seen it. This year, there’s more ghouls, goblins and terrifying scenes for the most willing of audiences. For the little ones—expect fun stuff during the day: Looney Tunes SPOOKY TOWN, Scary-Oke, the Six Flags Spooktacular Street Party (a musical yet zombified salute to the King of Pop) and costume catwalk. And we’ve heard that some have been told to leave their children under 12 at home once the sun goes down. In its final weekend, expect all the stops pulled out from under you like a trap door. 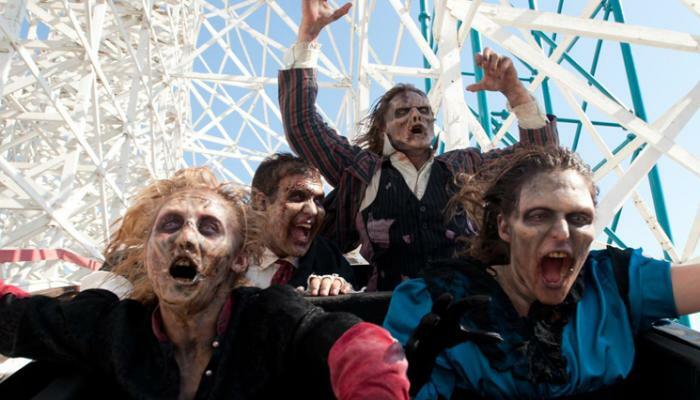 Be prepared to scream, run and have the spookiest time in the southwest! Get your tickets here. Ripley’s Nightmare at the Wax Museum - Also in its final weekend, Ripley’s Nightmare at the Wax museum takes the scariest characters from your favorite horror films and puts them in one place—a nightmarish wax museum. Ah! But the scariest thing is, they’re not just wax this time, they’re very much alive and bloodthirsty. Unleash your Hallo-scream with Jason, Leatherface, killer clowns and more. For an extra bit of horror, check out the Mirror Maze that is haunted with characters from your worst nightmares! Take a look at my experience behind the scenes at Nightmare at the Wax Museum. Buy tickets here. Trick or Tours & Flashlight Fright at Globe Life Park in Arlington - Head to Globe Life Park in Arlington October 30th ( 3 pm and 5 pm) and 31st (11 am, 1 pm, 3 pm and 5 pm) for activities, games, stories, tricks and treats at every stop...PLUS fun time in the kid’s zone after select tours. Adults are able to get the full tour experience while ensuring a safe, fun holiday experience for the little ones! Prices are $15/kid, $10/adult. Discounts are available for multi-child families. Pre-purchase is not required, but recommended. Appropriate costumes welcome. Call 817-273-5099 for details or click here. Flashlight Fright - A special after dark tour of the ballpark using NOTHING BUT FLASHLIGHTS! More suitable for older children and adults, no young children are allowed on this tour. Come see what might pop up when the ballpark is dark! Tours are $15 per person. Once again, pre-purchase is recommended but not required. October 30th and 31st, both dates start at 8 pm. Call 817-273-5099 if interested or click here. Halloween Boo Bash at Alley Cats - For $19.99 a person, show off your scariest, funniest or most creative costume (there will be contests and drawings!) and get unlimited bowling, putt-putt AND laser tag at Alley Cats! Plus, this sweet deal includes unlimited soft drinks. Click here for the deal.